Rats thrive in sewers but very occasionally will find their way into our gardens, sheds and garden rooms – and sometimes even inside the house. They're usually looking for food, but they breed quickly, cause damage by gnawing through building materials and pose a serious health risk. Rats live in large families – and a single breeding pair can multiply to 1,000 rats within a year. So killing a few here and there won't do the trick permanently: instead, prevention is vital. So, how to prevent and get rid of rats, and fast? Use our advice below to find out how. Find out how to get rid of all sorts of household pests. Then see all our cleaning how-tos and hacks to keep your home sparkling. Teeth marks on anything from fencing to the garden hose. Why have rats infested your home or garden? Rats prefer a quiet life, living in the shadows, scurrying about in sewers and, ideally, keeping well away from us. So why are you seeing them around your home? Other than the issues you can deal with, such as food sources being accessible to them (see below), there are a number of reasons why they might be appearing. Perhaps there are building works nearby that have destroyed their home – it needn't be a big building site, even a basement conversion nearby might be enough to dislodge a colony? Have the drains or sewers underneath your house flooded or blocked recently? This can precede a rat infestation. Is there an empty house or derelict building nearby? If a colony has set up there, they might be looking further and further afield for food. If you've just moved into a home, are renting with other, less careful tenants or have slipped into bad habits, you might be making your home a magnet to rats. The best way to keep rats away in the first place is by keeping your home's exterior – back and front – clean and tidy. That doesn't just mean ensuring that food waste is carefully stashed in a bin with a lid that can be fastened down, it also means ensuring anything rats can eat in your garden – from vegetables on a compost heap to fallen fruit to bird food – are dealt with. It might be that your compost heap has to go in a composting bin, while fallen fruit shouldn't be left lying around. If you've recently planted out new bulbs or have a new vegetable garden, protect it under soil netting laid just beneath the soil. Look out for signs, too, of small holes and chewed netting – hungry rats can be determined. Rats will also seek out sources of water, so if your garden tap is dripping, you have a shallow pond or a bird bath, you might like to ensure they're kept dry while you deal with the problem. This extends to your dog or cat's food and water bowls – bring them inside to make your home's exterior less attractive to rats. We're constantly encouraged to create piles of wood and garden clippings so that hedgehogs can nest. But if the shelters you've created are being inhabited by rats instead, clear them away and cut back overgrown areas while you deal with the rat infestation. Despite various sources suggesting peppermint oil and cat nip as good ways to get rid of rats, rat poison is, unfortunately, really the most successful method for dealing with a rat infestation. However, there's no point in putting down poison if you've not dealt with food sources and shelter. The best advice with using rat poison is to employ professionals. Other than the fact that it's ill-advised to place rat poison near where you grow food, that any rats that die from poisoning within your house or garden will make a fabulous meal for maggots, will smell terrible and release particulates that can make humans and pets really ill, the poisons themselves can kill children and pets and can make adults very sick. There are various options available, should you not want to or be able to use rat poison. Live traps are small cages laden with food bait; these might be a first option if you're not sure what type of infestation you're dealing with and want to find out more. Snap traps are designed to kill rats instantly, and may do the job if your rat infestation is a small one that's not yet taken hold. Electrocution traps are another method, but one that's much more expensive. Still, the effect is instant so, in theory, the rats won't suffer. If you want to prevent a rat problem (rather than see one off), getting a dog or cat is a good way to do so. 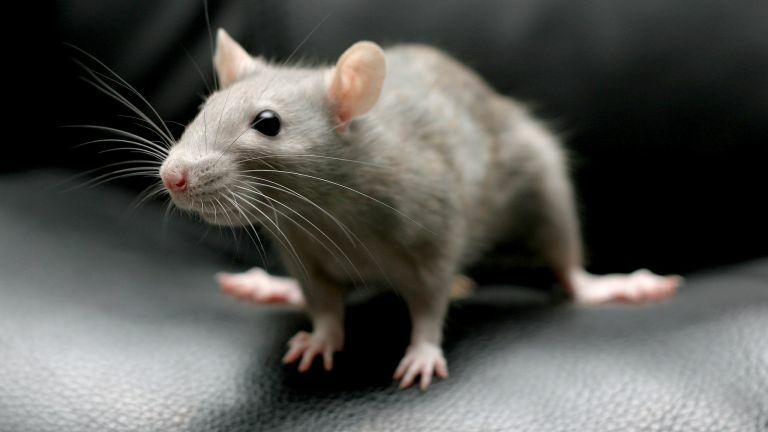 It won't get rid of a colony of rats, but having a pet will deter them and alert you to a potential problem. Like mice, rats will try to enter your home through any gaps or cracks in walls, doors, floors and even through the roof. And, like mice, they can chew through all sorts of materials. Inside the house and out in the garden, look for small holes (a rat can squeeze through a coin-sized hole) and use an appropriate sealant to block them – you can buy mouse and rat gap sealant that they can't gnaw through. Make sure, too, that there are no hollows under the shed, garden room or summer house that can serve as a potential hiding place/nest. Plug these with wire mesh or, better still, brickwork. As well as the loft or a cellar, you might find rats inside kitchen cupboards, behind the oven and fridge – in other words, anywhere dark they can shelter. How to get rid of the rates? Call in the professionals. If you can't get an immediate appointment, fill the rat holes with wire mesh, which they can't chew through. Then use a strong filler or expanding foam. The fillers won't deter them long term, but the wire will slow them down while you deal with the problem. Then, ensure you've taken care of any food they might be able to access, as advised above.